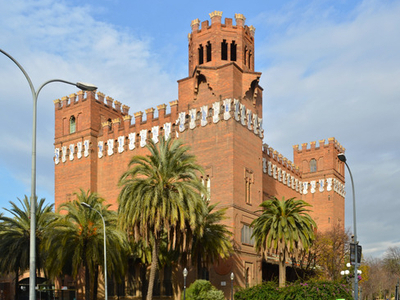 The Castle of the Three Dragons (Spanish: Castillo de los Tres Dragones, Catalan: Castell dels Tres Dracs) is the popular name given to the modernisme building built between 1887-1888 as a Café-Restaurant for the Exposición Universal de Barcelona in 1888 by Lluís Domènech i Montaner. This name was probably adopted from the 1865 novel by Serafí Pitarra. It is built with brick and sheet iron, and is a castle-shaped building crowned with battlements. The floor is almost square, with four towers at the corners and perimeter walkways running between a double facade. It has an innovative transparent structure of brick and iron, something similar to which appeared in the proposal by Hendrik Petrus Berlage in his project for the Amsterdam Stock Exchange. The ceramic decoration-patterned Joan Llimona and Alexandre de Riquer (1888), and Pius Font i Quer and Joan Baptista Aguilar-Amat (1927), sculpture by Antoni Vilanova, Alfons execution Juyol (1888) and Gonzalez Brothers (1927 ) and i Pujol ceramic Bausis-is located on the battlements and shield-shaped panels to the top, that break in blue on white a naturalistic program of plants and animals, including a number of drinks and liquors. The windows, missing hand, are the work of Antoni Rigalt i Blanch. Here's the our members favorite photos of "Key Buildings in Barcelona". Upload your photo of Castle of the Three Dragons!